Welcome to the new home for HEI's technical documents. Our partners at Techstreet are the official outlet for all standards from the Heat Exchange Institute. This bundle includes all HEI Standards. 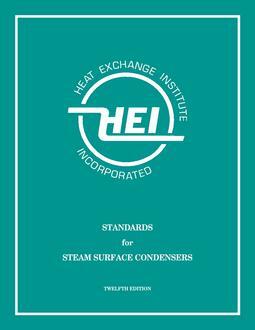 The 12th Edition of the Standards for Steam Surface Condensers has incorporated several new revisions since the 11th edition, such as FM tube material and gauge correction factors, three (triple) pressure designs equations, condenser hotwells, nuclear applications, atmosphere relief devices, consdenser tube cleaning, steam inlet expansion joints and several new Appendices. These Standards provide practical information on nomenclature, dimensions, construction, and testing of direct contact barometric condensers. These standards provide practical information on nomenclature, dimensions, testing, and performance. Use of the standards will ensure a minimum of misunderstanding between Manufacturer and Purchaser, and will assist in the proper selection of equipment best suited to the requirements of the application. Combines present industry standards, typical purchaser requirements, and manufacturers' experience in outlining the important design criteria for shell & tube heat exchangers. Topics pertinent to shell & tube heat exchanger include materials of construction, tube-to-tubesheet welds, temperature efficiency curves, and typical shell requirements. Presents industry standards and factory test methods. Definitions and nomenclature for liquid ring vacuum pumps and compressors are included along with design specifications, operating variables, correction factors, and figures that describe single and/or two-stage flat port plates, conical ports, and test set-ups for vacuum pump performance. 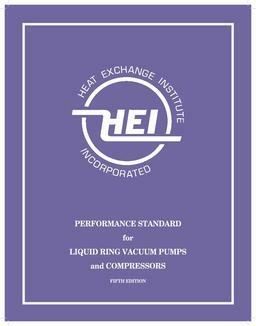 The Seventh Edition of this Standard has been developed by the Vacuum Technology Section of the Heat Exchange Institute, Inc. This edition includes corrections to the previous Standard, along with updated information gleaned from upgrades of other referenced Codes and Standards. This Standard reflects the collective knowledge and experience of the Deaerator Technical Committee, and is reviewed and discussed during regularly scheduled meetings. This process insures that the Standard will be regularly updated to reflect the changes in technology, codes, and member experience. The technical information in these standards combines present industry standards, typical Purchaser requirements, and Manufacturerâs experience. In addition, the standards outline the important design criteria for air cooled condensers. These standards provide practical information on nomenclature, dimensions, testing, and performance. This standard applies to completely assembled, inspected, and tested gasketed plate heat exchangers with elastomeric gaskets and carbon steel frames used in power plants. 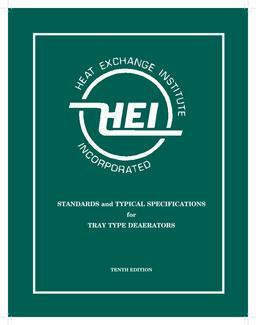 HEI is pleased to announce that the 12th Edition of Standards for Steam Surface Condensers is now available! Order Now! Get enterprise wide access to HEI publications. Learn More!